My camera has given me around 100 photo's this last week. The natives must be restless.I really liked the deer and skunk. I hope my electric fence has been keeping the skunk out of the beeyard. The top box should have 8 full frames of honey and one partially full. The partial should be located in the middle of the top box. 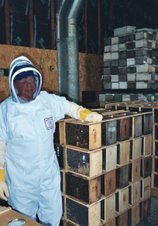 If you don't have enough honey the choices are, add a candy board on top of the hive or add granulated sugar on top of the hive. See how I did this on my last January post. Click on the arrow to see the video.